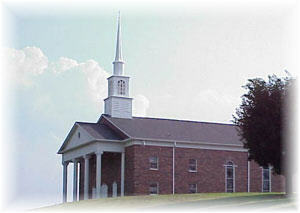 "Home of Foothills Baptist Bible College"
Gospel of the Lord Jesus Christ not only at home, but also throughout the world. Zion Hill Baptist Church is nestled in the foothills of the beautiful and majestic Blue Ridge Mountains. We, through our local ministry, radio ministries, missionaries, and the printed page, are seeking to spread the Word of God far and wide, in preparation for the soon return of the Lord Jesus Christ. Thank you for visiting our web-site. I trust that every time you visit that you will receive something for your life that will help make your day. The Bible says in 1 Timothy 1:15, "Christ Jesus came into the world to save sinners." To all who believe, Jesus is precious. May this site uplift and magnify Him! Leave us an e-mail note since you have visited our site. We would like to hear from you and would like for you to pray for us. the family. Click on the Return America graphic to go to their page. the edification of the saints, and the salvation of sinners.